For centuries, merchants from Africa and Asia followed the monsoon winds to the thriving ports of the Malabar and Coromandel coasts in search of the riches of Southern India. The modern traveller is just as well rewarded. Southern India is the country's Dravidian heartland where great civilizations, from the ancient Chola Dynasty to the British Raj, have left a legacy of temples, palaces and graceful cities. The tranquil beauty of the Kerala backwaters, the elegant Palace of Mysore, the peaceful Hoysala temples, and the bustling bazaars of Madurai and Cochin are just some of the highlights of this journey through one of India's lesser known regions. Arrive at Bangalore. Meet and assist at the airport. Upon arrival transfer to the hotel. 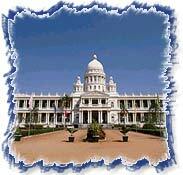 Later visit Bangalore's botanical gardens before touring the ancient Bull Temple and Tipu Sultan's Palace. Then transefr to the hotel for overnight stay. A relaxing start to the day as we ascended Chamundi Hill - the Climb is said to improve one's karma - for Panoramic views of the city and the giant statue of the Nandi bull. Day is free for leisure at the local market. Overnight stay at the hotel. Chennai is a bustling city with a relaxed and friendly character. Our tour commerce in the area around the 17th century Fort St. George, taking in St. Mary's Church where Clive of India was married, before a visit to the Government Museum to view the Chola bronzes. Finally we visit San Thome Catherdal, said to house the remains of the apostle. Thomas who is reputed to have brought Christianity to India in the 1st century AD. The afternoon, drive to Mahabalipuram, 55 kms and 1 1/2 hrs. Upon arrival transfer to the hotel. 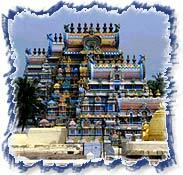 After breakfast, visit the place, where the legendary Pallava Kings Commissioned a range of temples. The most famous is the shore temple, romantically weathered by wind and sea. Later proceed driving to the great Chola Capital - Tanjore (290 kms / 6 Hrs). Enjoy morning and evening game viewing in the wildlife sanctuary of Periyar where elephant, sambar, bison and spotted deer may be seen during our lake cruise. Thekkady is renowned for its spices, and the aroma of cinnamon, nutmeg, pepper and a multitude of other spices scent the air as we explore a spice garden. The drive to Kumarakom (130 km / 4hrs) negotiates some of India's most stunning scenery. From the sea of clouds over the Cardamom Hills we descend into the lush backwaters of Kerala to Kumarakom. Later visit Kumarakom Bird Sanctuary. Overnight stay at the hotel. 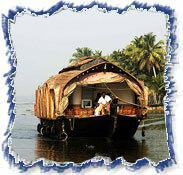 After breakfast, disembark the houseboat, and drive to Cochin, 90 kms and 01 hrs. Cochin is a curious blend of medieval Portugal, Mercandle Holland and an English country village, set on the exotic Malabar coast. Morning tour of the opulent Mattancherry Palace, a gift from the Portuguese to the Raja of Cochin. The place has a collection of remarkable 16th century murals painted on wooden walls. In the old Jewish quarter we visit the ancient Synagogue. Later the warehouse and shops provide us with some of the best shopping in India. We conclude our visit with the Church of St. Francis and the tomb of Vasco Da Gama. In the evening there is an opportunity to experience the renowned Kathakail dance at a local hall.